It started out innocently enough. I began going to a coffee shop more than 10 years ago to read and to sometimes meet friends. Actually, I should be honest. It started farther back, in college, studying at a local coffee shop where the waiters became our friends. Where the good looking waiters became our good friends….and it was then that I realized I liked coffee. But not coffee itself, of course! Because I’m really a tea drinker. Come from a long line of tea drinkers. What I really liked were mochas. Dessert drinks. So every once in a while I’d stop in and treat myself. Fast forward to probably 5 years ago and I’d developed a deep and abiding love of specialized espresso concoctions. Large (Let’s just call a spade a spade – Venti!) mochas. Wanting to be somewhat health conscious I always ordered decaf, skim milk, no whipped cream, and resisted the urge to ask for extra chocolate…usually. We all have our vices and going more than 3 days without one felt like a true sacrifice. So I tried to squeeze in the extra time to stop in and grab my lovely espresso on my way to work each day. If the line was long or getting out of the house on time proved impossible (we’ve moved forward in time, remember- so now there are children, pets, etc… running late happens), I felt cheated. If my mocha tasted mediocre I was annoyed beyond belief – at whoever made it and at myself for paying so much for a coffee drink I didn’t love! And I didn’t have the time to wait for them to make a new tasty one so I’d walk off with my bitter drink and my bitter feelings. When the prices began inching up I decided to limit myself to no more than three per week. Let me rephrase. I did my best, occasionally succeeding, in limiting myself to three or less per week. No eye rolling, please – for me it was a step down. When they hit more than $4 per drink (Venti mochas, remember?!) I griped and felt annoyed, but also felt entitled to my one treat. In a day during which I spent most of my time taking care of everyone around me it seemed like a small thing. Important note- It turns out that I have the incredible skill of being able to justify almost anything. And then the price inched toward $5. For a drink, a non-alcoholic drink! And that was my own wake up call. I decided to change my ways and my online research began. 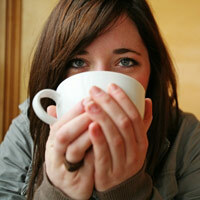 I joined coffee lovers forums (though I still cannot bear regular coffee or a simple espresso. Which you should never fess up to on a site like that, I discovered, unless you enjoy being ridiculed) and trolled the websites. If I invested in a good grinder (vital to good coffee…who knew?!) and a good espresso machine I might be able to forgo the coffee shop stops. I did my research and after a few weeks took the frightening leap. I ordered everything I needed – the high quality grinder and espresso machines, the espresso cups, mocha powder, a frothing mug and an espresso bean storage container (again, never had a clue that they are best kept in a dark airtight container as whole beans and you should only grind them right before using.) Did I mention how much time I spent on those coffee sites? I went to a local well-reputed café and bought the coffee beans. Only two weeks worth, of course as I’d been instructed by true coffee gurus and I was ready. It has now been more than a month and my homemade mochas are improving. They were never terrible but haven’t yet reached the great coffee shop level. They are certainly better than the coffee shop blunders I occasionally drank. When I run into a problem with flavor I go back into those coffee lover forums and get advice. And I cut myself some slack because I’m so glad to be doing this for myself. My pride and ego have stopped me from buying a single mocha…so far. I am saving money (or will be soon) and am saving time I didn’t really have to start with. The satisfaction of not handing someone $5 each day for a coffee drink: Priceless!